Rose Gottemoeller is undersecretary of state for arms control and international security. She previously was assistant secretary of state for arms control, verification, and compliance. While in that position, she served as the chief U.S. negotiator of the New Strategic Arms Reduction Treaty (New START) with Russia. During the Clinton administration, she held positions in the Department of Energy and on the National Security Council staff dealing with nuclear weapons issues in the former Soviet Union. Gottemoeller spoke with Arms Control Today in her office on October 9. Much of the discussion focused on U.S.-Russian nuclear relations and U.S. progress in meeting its commitments under the nuclear Nonproliferation Treaty (NPT). The interview was transcribed by Jennifer Ginsburg. It has been edited for clarity. ACT: Thank you for taking the time to talk to us. We’re going to get into the details of a number of specific issues, but I just wanted to start by asking you to give us an overview of U.S.-Russian cooperation on nuclear arms control, nonproliferation, and nuclear materials security. For example, there was an announcement earlier this month about the successful removal of highly enriched uranium from Kazakhstan, so Russia and the United States appear to be continuing some of their cooperation in that area. On the other hand, the dialogue on further nuclear arsenal reductions and cooperation on missile defense appears to have been suspended. So, how would you broadly characterize the U.S.-Russian relationship in this area and the prospects for the future? Gottemoeller: There’s no question that the current bilateral crisis and international crisis over Ukraine has affected the overarching U.S.-Russian relationship, and that is an extraordinarily serious matter. At the same time, I think it is worthwhile remembering that historically we have, through the 40-year history of our nuclear arms control and limitation relations with the Soviet Union and Russian Federation, strived to continue this cooperation as something that is very much in the security interests of us and our allies. So, I would say that there is a certain element of continuity at the moment, despite a very difficult international situation now surrounding the crisis in Ukraine. That has manifested itself in very solid, businesslike cooperation on implementation of New START, which continues to go forward in a very straightforward way. We’ve had regular inspection activities, exchanges of data—the [most recent] data exchange just occurred a week or two ago. We have had exchanges of notifications, notifying us on the movements of Russian strategic forces. The Bilateral Consultative Commission, the implementing body of the treaty, is now in session in Geneva. They’re tackling a couple of implementation issues, which seem to be pretty straightforward. So, the bottom line is a continuity that I think is healthy and a good thing for our national security. On the nuclear security side of things, clearly this has been a big focus for President [Barack] Obama with the phenomenon of the nuclear security summits. He’ll be hosting the next one here in the United States in 2016 after three successful meetings, first in Washington, then one in Seoul, South Korea, and the last one in The Hague, in the Netherlands. [The 2016 summit] is to address and to continue to address the issues surrounding the security of nuclear materials, fissile materials, [and] the dangers from radiological substances. Here, the cooperation with Russia continues to be very solid as well, and we will continue to have some goals in mind for that joint work. Recently, the highly enriched uranium was removed from Kazakhstan. There is highly enriched uranium still in Belarus. We would certainly like to be able to tackle that, working together with the Russian Federation. So, nuclear security summit cooperation, getting fissile material under control internationally, minimizing its use—those goals will continue to be shared with Russia. But again, there are difficulties that have come into play recently. Because of the larger international crisis around Ukraine, we have been quite concerned that the Russians don’t seem to be thinking beyond the end of 2014 about continuing expansive threat reduction cooperation, which we think could really be taking place in third countries, third regions of the world beyond the territory of the former Soviet Union, beyond Russian territory. Certainly, we’d like to be working with the Russians on projects in other areas. But at the moment, that does not seem to be in the cards. ACT: You talked about goals, and you mentioned Belarus. Is there a timetable? Is the idea to get everything out of Belarus by the 2016 summit? Gottemoeller: There will be definitely efforts to work on this issue with the government in Minsk, but I wouldn’t say that there’s a strict deadline or timetable. It’s been a work in progress, but I would say it’s been an area where there’s been some steady progress. ACT: Earlier this year, the United States charged that Russia had violated the Intermediate-Range Nuclear Forces [INF] Treaty, and you said that “the United States is wholly committed to the continued viability of the INF Treaty” and is “asking Russia to return to compliance with the treaty in a verifiable manner.” You and your colleagues met with your Russian counterparts on that issue recently. Can you give us a general sense of any progress you’ve made towards resolving the issue and tell us what the next steps in the process are? Gottemoeller: I would say that the most important result of the talks in Moscow on September 11 was a reconfirmation by both Washington and Moscow of the importance of the Intermediate-Range Nuclear Forces Treaty to our mutual security and a stated desire to see the treaty continue into the future. It’s been interesting to me—there’s obviously a big debate on this topic in Moscow, with voices on both sides. Some voices we’ve known about for well over a decade, raised to say, “Hey, you know, maybe it’s time to get out of this treaty,” but other voices, equally strong, saying that this treaty serves Russia’s national security interests. So, we are conducting diplomacy in the midst of an important national security debate in Russia, and I’m pleased to see so far that we have a kind of stable backdrop in these statements for the need to retain the treaty going forward. Most recently, actually, a high-level voice that was articulating this view was Sergey Ivanov, the chief of staff to President [Vladimir] Putin in the Kremlin, who has been one of the critics of the treaty in the past. But in a recent public interview, he said that, for the time being, the treaty should be preserved. So, I think that it’s an interesting environment [in which] to conduct this diplomacy, but I also see that there is some time and space to conduct it, and we will see. I can’t tell you what the outcome is, though; so far, it’s too much early days. ACT: But you get a sense from your knowledge of the Russian players and the Russian scene that there is a general commitment to staying in the treaty, or is that still not certain? Gottemoeller: No, I think the important point to say is that there is a debate going on. There are obviously experts as well as authoritative voices on both sides of the debate. I will say that recent comments by Russian officials and by the Russian government overall about the viability and importance of the treaty for the time being give us time and space to negotiate, and I think that’s very important. ACT: Do you have another meeting scheduled? Gottemoeller: It’s an ongoing process. ACT: In 2007, the United States and Russia together called for the globalization of the INF Treaty, presumably to curb missile buildups by China, India, Pakistan, and others. Is that concept still supported by the United States, and is it something the United States and Russia might work on together? Gottemoeller: Clearly, this is a proposal that was made in the First Committee [of the UN General Assembly] back in 2007 with the support of the Bush administration. We haven’t taken this offer off the table. But by the same token, the First Committee hasn’t had a discussion of it in some time. Frankly, at the moment, our focus has been on the immediacy of this compliance issue regarding a ground-launched cruise missile that we believe was tested at intermediate range. That’s where our focus has been at the present time, and it will be our early focus. But this other aspect is on the table. It needs a lot of discussion if it’s to be developed. ACT: Can you tell us anything about any kind of progress on the issue of the ground-launched cruise missile? Any acknowledgement by Russia of the U.S. concerns, or can you characterize the discussions on that in any way? Gottemoeller: No, I’d rather not get into the confidential aspects of the diplomatic exchange. ACT: Talking more broadly about reductions, in 2013 the United States proposed to Russia that the two countries cut their strategic nuclear arsenals to levels one-third below the ceilings set in New START, and Russia has apparently rejected the proposal. You recently told The New York Times, “I could imagine Putin might well decide it’s in his interest to seek more cuts” and “I don’t discard the notion we could do it again.” Why does it remain in the U.S. and Russian interests to achieve further cuts? Gottemoeller: Well, first of all, at the very top level of policy, we have a commitment, an obligation, under the nuclear Nonproliferation Treaty, Article VI, to continue a steady process of disarmament, and President Obama has been very articulate that this is indeed the U.S. national policy. In his speech in Prague [in April 2009], he laid out very clearly that de-emphasizing nuclear weapons; tackling the problems of fissile material protection, control, accounting, and elimination; and moving steadily toward a world free of nuclear weapons is a national goal for the United States. At the very highest level of policy, this is our goal; for that reason, I think it is important to continue to pursue it. But in talking about this proposal for an up-to-one-third further reduction beyond the New START central limit on operationally deployed nuclear warheads, the president very clearly articulated that we had done the detailed calculations to understand that we could undertake these further reductions without any detriment to our own national security. We believe that it’s a good deal for us. We believe it’s a good deal for the Russians as well, so we have asked them to take a look at it. Those clearly have been our talking points ever since the Berlin proposal went on the table in July of 2013. Interestingly, you said that the Putin administration rejected it. It’s not ever been officially rejected. I would say that it’s an area that they haven’t really engaged in explicitly since the period around the time of the NPT [Preparatory Committee meeting] in May when they put forward their official position that they are not engaging currently in bilateral arms reductions, but they want to try to turn their attention toward multilateral arms reductions. So, I would say from our perspective the Berlin proposal is on the table, it hasn’t been rejected by the Russians, but they are clearly saying they are more interested in multilateral rather than bilateral reductions at this point. ACT: I want to get back to the multilateral [aspect] in just a second, but your comment in the Times, I think, seemed more optimistic than many people’s, holding out the possibility that there could be some kind of agreement. So just conceptually, what would an agreement look like that could be satisfactory both to the Russians and to the U.S. Congress? It seems in a lot of ways the two sides almost have mutually exclusive demands for what a treaty would look like. Gottemoeller: I don’t know why you would say that. The focus in this case would be a very straightforward and simple one, that is, up to one-third further reductions in the central limits of New START, and New START itself would provide the superstructure in terms of the verification regime and notification regime, the definitional aspects, the data exchange. There wouldn’t have to be a good deal of new negotiation. In short, the battles that were fought over the ratification of New START would not have to be fought again. But of course, the Senate would want to take a very careful look at further reductions and understand what their meaning would be for U.S. national security. So, I don’t see in this case why there would be a juxtaposition of Russian versus Senate views. Of course, the big issue in [the debate over] New START ratification was the missile defense issue and concerns on Capitol Hill that we were somehow constraining missile defense deployments [although], of course, that is not the case. But I don’t see the necessity of that issue being replayed in this case. ACT: So, the proposal is still on the table, and it’s essentially up to the Russians to decide when they want to respond to it? Gottemoeller: It’s up to the Russians to decide whether it’s in their interests or not to do so. ACT: You mentioned the multilateral cuts the Russians have mentioned. Is the administration pursuing any kind of multilateral initiatives or considering any kind of multilateral initiatives that would involve Russia plus other nuclear-armed states or nuclear-armed states other than Russia in terms of reducing the U.S. arsenal? Gottemoeller: First of all, it’s early days from our perspective to engage in multilateral arms reductions. We and the Russians still have over 90 percent of the nuclear weapons in the world, and there is still room in our view—and we’ve been very open and public about this—for further bilateral nuclear arms reductions. We do have, I would say, a very solid P5 process [of discussions among the five nuclear-weapon states], which I know you have just written about, calling it the “art of the possible,” in the October edition of your magazine. We do indeed consider it the art of the possible. It has brought together some very important discussions among a community of P5 actors who never had to grapple with nuclear issues in the way we are now. I think that we are, in that way, laying the foundation for future multilateral arms reductions. But from our perspective, it is early days to be considering them, as there is still plenty of room for bilateral arms reductions between Russia and the United States. ACT: We wanted to ask next about the NPT. What are the overall U.S. goals for the 2015 NPT Review Conference? Gottemoeller: First and foremost, we want to ensure that all three pillars of the NPT are addressed and that all signatories of the NPT are taking the responsibility to fulfill the actions that they took upon themselves in the 2010 action plan. So, the basic point here is that the NPT signatories include both nuclear-weapon states and non-nuclear-weapon states and all signatories of the NPT have responsibilities toward the disarmament pillar, the nonproliferation pillar, and the pillar that is involved with peaceful uses of the atom. We want to ensure that that message gets out there and that everybody is pulling their weight in the NPT system. We will be working hard ourselves to make the case that what we are doing is fully serving the interests of the NPT and the nonproliferation regime, and we’ll see how it goes. ACT: Among other points, the final document from the 2010 NPT Review Conference “affirm[ed] the need for the nuclear-weapon States to reduce and eliminate all types of their nuclear weapons and encourage[d], in particular, those states with the largest nuclear arsenals to lead efforts in this regard.” How well do you think the United States and other countries have done in fulfilling the action plan that was created at the 2010 review conference? Gottemoeller: Oh, I think we’ve done a spectacular job. I just pulled out the table that shows the height of our nuclear weapons arsenal—not just deployed, but deployed and nondeployed—31,000-plus nuclear weapons at the height of the arsenal numbers in 1967, now dropped off to 4,800 at this point. So, we’ve had a really steady reduction in the number of our nuclear warheads in the years especially since the end of the Cold War. In addition, we continue to de-emphasize nuclear weapons in our national doctrine and policy, we continue to imbue that doctrine and policy in our approach to targeting, and we continue to reduce and eliminate nuclear delivery vehicles. So, I think we’ve been doing a pretty good job—not a pretty good job, a spectacular job, let me put it that way. ACT: As you certainly know though, some non-nuclear-weapon states have expressed disappointment or frustration with the pace of nuclear disarmament by the nuclear-weapon states since 2010. You’ve responded in part by pointing out reductions in the size of the U.S. arsenal as you just did, with the table you just referred to. But given that the final document calls for the nuclear-weapon states “to accelerate concrete progress on the steps leading to nuclear disarmament,” isn’t there some merit to their complaints? Gottemoeller: No, I don’t think so. I have concerns, as I mentioned, that we need a willing partner for further bilateral reduction negotiations, and I do believe that they are extraordinarily important. With the Russians and the United States having over 90 percent of the nuclear weapons still in the world, we need to continue to reduce and eliminate our stockpiles. But I think it’s also important for the non-nuclear-weapon states to begin to develop an understanding of how much work it takes to reduce and eliminate nuclear weapons, to get rid of fissile material, and reduce and eliminate delivery vehicles. So frankly, I think where the problem has been, it’s been inadequate communications between the nuclear-weapon states and the non-nuclear-weapon states, and that’s one area we have been trying to rectify. The reporting exercise that we undertook throughout this review cycle that produced our nuclear report [at the] last [Preparatory Committee meeting] in May, that I think was an important step in the right direction. But frankly, I do think we need to do better. I will say that we do a spectacular job in reducing and eliminating our nuclear arsenals, but we need to do a better job of communicating in a forceful way, in a convincing way, exactly how difficult that is to do and why it takes some time. ACT: So, that’s the part that hasn’t been communicated, that the non-nuclear-weapon states have some unrealistic expectations about how quickly this could be moving? Is that what needs to be communicated? Gottemoeller: I would say yes, they don’t have a good feel for how complicated and difficult it is to get rid of thousands of nuclear weapons and that it takes time and can only be done carefully. Otherwise, it would be very irresponsible for the environment, for public health, and, indeed, for the way we expend our resources. ACT: So, what are you doing to convey that? How are you remedying this communication problem? Gottemoeller: We’re beginning to look at more regularized communications among certain key players [among] the non-nuclear-weapon states. It will be interesting; we have another P5 conference coming up early next year. This time, it will be taking place in London. We are looking for ways, as we’ve done in the past, to even enhance the kind of outreach to other audiences that we have done on the margins of these meetings over the last five years. ACT: You mentioned those P5 meetings a couple of times, and you said they’re proving fruitful. What tangible results do you see so far, and what would you like to see the group discuss or agree to do in the future? Gottemoeller: Tangible results sometimes are the results of the forming of a community. It’s interesting because the P5 have been grouped together historically as the nuclear-weapon states under the NPT, but to have a community of both experts and policy-level people who regularly meet and talk together and begin to communicate and begin to impart real information and real mutual understanding—it sounds a bit hokey, but actually, I think that that is one of the biggest payoffs so far from the process. I can see it in the progression of the meetings since London in 2009, which was kind of a proto-meeting—I don’t think anybody had any idea what we were about, what we were going about, at that point—up to this new meeting in London in 2015 where we’ve got really deep communication and reports about what we’ve been up to, in things like nuclear terminology with a glossary that will be published in the spring in time for the [review conference] and projects on verification, a working group on CTBT verification, that we’ll be reporting on. There is a lot of tangible communication, which is bearing fruit and laying the foundation for eventual multilateral negotiations. ACT: But I think it’s probably fair to say that a lot of the non-nuclear-weapon states expected this P5 process would actually produce some concrete results in time for the 2015 review conference. Gottemoeller: That’s what I’m saying. We have gotten concrete results. But what do you mean by concrete results? ACT: Something that shows either actual reductions or putting you on a clear path toward further reductions, I think. Gottemoeller: We’ve got further reductions. There are steady reductions going on under New START, and if you dig down and look at trying to structure P5 reductions at this point, it doesn’t make sense because the UK, France, and China have so many fewer weapons than the United States and Russia. So when people kind of wave their arms and say there should be further reductions involving the P5, they’ve got to look inside the balance of numbers between and among the five and think what makes sense. What makes sense is the reductions that are taking place under New START right now. ACT: And what about transparency measures? Gottemoeller: That’s part of what we’re doing. I mentioned the CTBT verification work that we’re doing, and we’re pushing to do more of that. ACT: In an April speech, you said that it is “imperative to make sure that people remember the human impact of nuclear weapons” and that “it is the United States’ deep understanding of the consequences of nuclear weapons use—including the devastating health effects—that has guided and motivated us to reduce and ultimately eliminate these most hazardous weapons.” A third conference on the humanitarian impact of nuclear weapons use is being held in Vienna in December. Will the United States join its allies such as Japan and participate in the conference? Gottemoeller: We’re considering our options right now. We haven’t made any decision just yet. ACT: Do you have a timetable? Gottemoeller: Our timetable is formed by the fact that the schedule of the meeting is the first week in December. So, we’re going to have to make up our mind between now and then. ACT: Can you tell us about what some of the considerations, in general terms, are? Gottemoeller: The basic consideration all along and the basic worry that we have had is that we don’t have a straightforward or a clear view on the up-and-up about what these conferences are about. We are very supportive of the notion that we need to be educating the public, we need to be informing the international community, we need to be enhancing people’s understanding of the human impacts of nuclear weapons use. That, to me, is near and dear to my heart because we don’t really have that same interest among the public, and especially among young people, that we had historically, [in] the problem of nuclear weapons and what nuclear weapons mean in terms of devastation. But at the same time that some conference organizers say this is all about informing, educating, getting the story out there, others say this is about establishing a pathway to a convention banning nuclear weapons and outlawing them under international humanitarian law. With that goal, we cannot agree, so we need to understand on the up-and-up what the conferences are about. ACT: Since the beginning of the Obama administration, you have sought to finally reach agreement at the Conference on Disarmament [CD] on negotiations for a global fissile material cutoff treaty [FMCT]. What are the main stumbling blocks at this point? Gottemoeller: Actually, I’m going to take this question in a completely different way, because I just came back from the First Committee in New York. I spent two days there and had a fascinating update on what is going on with this group of governmental experts that’s been meeting on the fissile material cutoff treaty. You know that this has been a great source of tension and anxiety in the international community that participates in the First Committee, that participates in the CD in recent years, because of concern that we were getting nowhere on an FMCT. But what the group of governmental experts has been able to accomplish is to open the floodgates for substantive discussions on this matter and to air all kinds of issues, from the verification of the treaty to the issue of stocks [of fissile material] to the issue—well, scope is related to whether stocks will be part of the treaty. The United States does not support that notion, but there has been an opportunity for all of these issues to be aired in a very substantive way at an expert level that has renewed the issue for the arms control community in the Conference on Disarmament in a very positive way. So whereas this has been a great source of tension and anxiety in all the years since I’ve been back in government, practically, I would say that I feel this is a year where we have made some significant progress on the issue. Gottemoeller: This will be a normal progression for a group of governmental experts. It will report out—there are a couple more sessions left to go—there will be a process of producing the report of the [group of experts], which will then be taken to the CD, as normal, and after that, we’ll see. By the way, the CD has had its own so-called schedule of activities going on, with a discussion there also of an FMCT. I think there’s been a beneficial feedback loop between the two sets of discussions, bringing many important and very meaty technical issues to the table for a very welcome airing. ACT: Is the United States working diplomatically with Pakistan, which has been the most public opponent of proceeding with the talks, and any others who might be hesitant, to try to shift their positions or discuss the issues? Is work taking place at that level as well? Gottemoeller: We’re working constantly with the entire CD community on this and with the First Committee community in recent days. So, it’s not only with Pakistan; we’re working with all interested parties. ACT: If progress remains blocked, should the issue remain in the Conference on Disarmament, or are there scenarios in which you would support moving it to another venue? Gottemoeller: No, I don’t see a need to. Again, I see that we’re in a much more hopeful moment on this matter thanks to the beneficial feedback loop between the CD’s discussions and what’s going on in the [group of experts]. ACT: With respect to fissile material production, one of the areas of concern has been South Asia, where India and Pakistan are believed to be producing fissile material for weapons. Administration officials have expressed concern at various points in time about the overall situation in South Asia in that regard. So, what steps do you think India and Pakistan could take, pending the beginning of negotiations on an FMCT to help contribute to the realization of a global treaty? Gottemoeller: First of all, they need to be present at the table for these discussions. I frankly regret that Pakistan chose not to join the [group of experts], but there has been an opportunity for them to participate in the CD discussions under the schedule of activities, so that’s very good. India has been participating. They need to be fully present, they need to make their issues known, they need to really articulate what their technical concerns are, and so forth. That is the first thing. The second thing is due regard for the challenges of properly protecting, in a physical protection sense, their fissile material holdings, as well as controlling and accounting for them. I’ve watched as both of those countries have participated in a responsible way in the nuclear security summits, and I hope that we will continue to see those trends develop. ACT: Earlier, you said it’s important in the NPT context for all nations to pull their weight, to do their part to fulfill the action plan. Some states, of course, are not members of the NPT, like India and Pakistan. What kind of steps could India and Pakistan, both of which say they support nondiscriminatory disarmament, take to contribute to the overall global nuclear disarmament process, even as the United States and Russia work to reduce their far larger stockpiles? Gottemoeller: Let’s take the example first of Pakistan. Under the nuclear security summit process, they have agreed to establish their regional training center on nuclear security matters as an asset for the IAEA [International Atomic Energy Agency] in the regional context, to provide training courses for regional partners, that type of thing. They can and they will play a role of that kind, and I think that’s very good, that’s very commendable. In the case of all states, whether they’re in or out of the NPT, but since the NPT is most states—this is apropos South Asia—they can also participate in other relevant activities such as the Global Initiative to Combat Nuclear Terrorism. And I think that that’s a very positive direction, that states can put up their hands and voluntarily contribute to the nuclear terrorism challenge. India has just ratified its additional protocol [to its safeguards agreement with the IAEA], and I have heard from Indian colleagues that they plan to be energetically and very actively implementing the measures under their additional protocol. So despite the fact that these countries are not signatories of the NPT, they have pledged to bolster the nonproliferation regime—that’s with small “n” and small “r”—and they have taken certain responsibilities to do so. We continue to urge them, and they have so far taken policy steps, to continue their moratoriums on nuclear testing. That’s a very important measure. So, there are a number of ways in which these countries can bolster the nonproliferation regime although they are not signatories of the NPT. ACT: You and other administration officials, including Secretary of Energy [Ernest] Moniz, have reiterated that the entry into force of the Comprehensive Test Ban Treaty [CTBT] remains a top priority for the United States and you’re working to educate senators as well as the U.S. public on the security benefits of the treaty as well as the dangerous health effects of explosive nuclear testing. You’ve also urged other CTBT Annex 2 states—that is, the other countries that are not party to the treaty—not to wait for the United States to ratify the CTBT. What steps is the United States taking and what arguments is it making in its dialogue with these other states to reinforce the global testing moratorium and bring them on board the treaty? ACT: In the first 100 days of President Obama’s time in office, in his Prague speech, he outlined a vision and framework for moving toward a world free of nuclear weapons. What are the major goals for moving forward on the so-called Prague agenda over the next two years of the Obama administration? Gottemoeller: I think we’ve had a good chance to talk about all of them today. One is continuing to encourage our Russian partners to return to the negotiating table—the president’s Berlin proposal being still on the table for an up-to-one-third further reduction in nuclear weapons; it will be to urge the NPT states, whether nuclear or non-nuclear states, to press forward in vigorous implementation of all of the tasks in the action plan, and that includes bolstering all three pillars of the NPT, whether we’re talking about nuclear disarmament or nonproliferation or peaceful uses. Everyone needs to be pulling their weight. Then for the United States, there will be a special focus on proceeding toward ratification of the Comprehensive Test Ban Treaty in a proper and deliberate way, developing public awareness and knowledge and understanding and grassroots support, and then we’ll see [about] bringing it back here to Washington for the Senate to consider. And fissile material—everything to do with fissile material, whether we’re talking about the controls and constraints and efforts to limit highly enriched uranium internationally—that’s part and parcel of the nuclear security summit efforts—or whether we’re talking about proceeding with negotiation of a fissile material cutoff treaty, we will be working hard on the fissile material end of the spectrum as well. I haven’t talked about the nuclear-weapon-free zones. Obviously, we would love to see all the nuclear-weapon-free-zone protocols come up and be ratified by the Senate as well. But for that, we have to get them all done. We did achieve at the [Preparatory Committee meeting] last spring [the] signature [by the nuclear-weapon states] of the protocol for the Central Asian nuclear-weapon-free zone; we are now focused on the Southeast Asian nuclear-weapon-free zone. In addition to those zone protocols, another important goal that came out of our action plan for the NPT was convening a conference on a Middle Eastern weapons of mass destruction-free zone. That has been a very, very difficult lift over the last five years. But I will say I think, at this point, we have moved much closer, and I hope that all countries in the region, the Arab states as well as Israel, will be willing to continue the preparatory process. My view is that we should be able to convene this conference before the [NPT review conference], but it’s going to take all states to really engage on it. So, that’s a very important goal as well. ACT: Including Iran, in that conference? Gottemoeller: Absolutely. They’ve been part of the process. ACT: Thank you. We really appreciate it. 1. “Kazakhstan Removes Research Reactor HEU,” World Nuclear News, October 3, 2014, http://www.world-nuclear-news.org/RS-Kazakhstan-removes-research-reactor-HEU-03101401.html. 2. 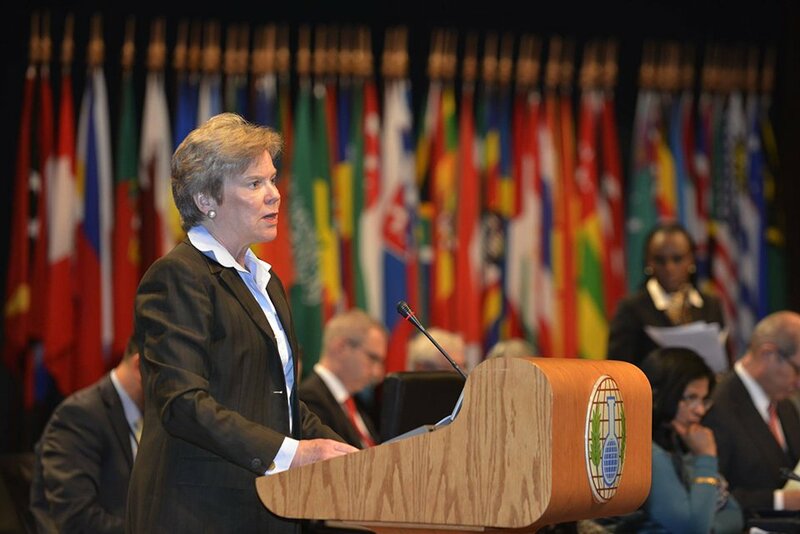 Rose Gottemoeller, Remarks at the Annual Deterrence Symposium, U.S. Strategic Command, Omaha, Nebraska, August 14, 2014, http://www.state.gov/t/us/2014/230636.htm. 3. “Ivanov: Russia Not to Quit INF Treaty Unless It Sees Security Threats,” RIA Novosti, September 21, 2014. 4. William J. Broad and David E. Sanger, “U.S. Ramping Up Major Renewal in Nuclear Arms,” The New York Times, September 21, 2014. 5. Andrea Berger and Malcolm Chalmers, “The Art of the Possible: The Future of the P5 Process on Nuclear Weapons,” Arms Control Today, October 2014. The five countries that the nuclear Nonproliferation Treaty recognizes as nuclear-weapon states (China, France, Russia, the United Kingdom, and the United States) also are the five permanent members of the UN Security Council. 6. 2010 Review Conference of the Parties to the Treaty on the Non-Proliferation of Nuclear Weapons, “Final Document, Volume I, Part I,” NPT/Conf.2010/50 (Vol. I), 2010 (hereinafter 2010 NPT Action Plan). 7. U.S. Department of State, “Transparency in the U.S. Nuclear Weapons Stockpile,” April 29, 2014, http://www.state.gov/t/avc/rls/225343.htm. 8. 2010 NPT Action Plan. 9. Rose Gottemoeller, Remarks at the Third Meeting of the Preparatory Committee for the 2015 Nuclear Non-Proliferation Treaty Review Conference, New York, April 29, 2014, http://usun.state.gov/briefing/statements/225351.htm. 10. Under Annex 2 of the Comprehensive Test Ban Treaty, 44 specified countries must ratify the treaty to bring it into force. The United States is on that list and is one of eight such countries that have not ratified the treaty. The others are China, Egypt, India, Iran, Israel, North Korea, and Pakistan. 11. John Kerry, Remarks at the Friends of the Comprehensive Nuclear-Test-Ban Treaty ministerial meeting, New York, September 26, 2014, http://www.state.gov/secretary/remarks/2014/09/232219.htm.